So there was a bug in the script I uploaded. Apparently it can use the mscompression library with x64, however the calling method is probably slightly wrong, which leads it to crash with x86. Anyways, the bug in the script even prevented x64 to work. Either way, the Jeff's bmzip loads the library as expected, and thus works on both x64/x86. So forget about the script uploaded yesterday. I just recompiled and successfully testet his clean source from github. The test was on bootmgr version 6.3.9600.16415. Let me know if there's still anything of significance that is unresolved regarding this file. Naah, I guess that the compiled version JFX posted on MSFN is fine. Though I actually fail to see the usefulness of a 64 bit version, a 64 bit compiled version is actually missing, seemingly (I believe the one paraglider posted is anyway an old version). Also I am not sure to understand whether in the "current version" there is (or there can be a difference) between using the ntdll or the bmzip's MScompression.dll. They're compression algorithms are different. And thus yields slightly different results when compressing. So, to sum up, in what may seem an exercise in futility we can use bmzip to decompress the BOOTMGR and then (once having NOT modified it) we can use you BOOTMGR Recompiler v2 to recompress it (choosing ntdll.dll) and the resulting file should be identical to the original? No reason not to use the 64bit version if you are using a 64bit os. Sure , but as well no real reason to not use the 32 bit version on it. I mean, this is not one of the (BTW very few programs) that will have an actual advantage in "64 bit form" over "plain" 32 bit one, as a matter of fact the only advantage is that of being a little bit larger. The only actual *need* for a 64 bit version is for use in an environment that is 64 bit AND lacks a 32 bit subsystem, i.e. in practice only in a "plain" Windows PE 64 built from WAIK/AIK/ADK according to MS or in a prebuilt WinRE 64 bit environment. Also, and JFYI, your 32 bit version DOES NOT run on my XP system. throwing an error about not being a valid Win32 app. Have not seen the particular version paraglider compiled, but judging from your report Wonko, my guess is you can easily fix it by changing the major version fields from 6 to 5 in the (PE) optional header. Sure , I know (and I already checked that it works, once that stupid setting has been set to 5) but thanks for the suggestion. I guess it is part of the "plan" to make XP seem more obsolete than it really is . 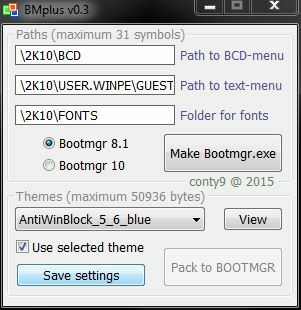 BMplus (current version v0.3). Utility for changing paths in BOOTMGR and appearance settings (themes). Description in Russian. Edited by conty9, 19 October 2015 - 04:44 PM. Seems like a nice tool, but have not tried it yet. Are you willing to share some information about what it does under hood? 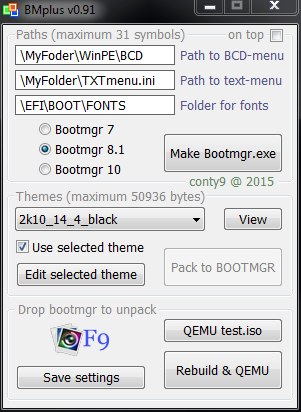 Try the latest version 0.91 : specify the paths (max - 31 symbols), choose a theme (check "use selected theme"), and press "Rebuild & QEMU". I do not know much English, so the the job description only in Russian. Edited by conty9, 22 October 2015 - 05:03 PM. I want change BCD path but i dont know exacly how. 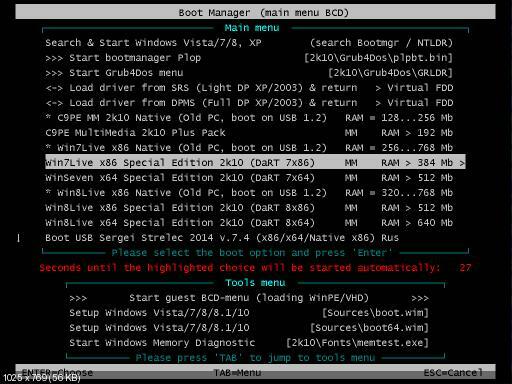 I have zbootmgr.exe but after replacing files my device not boot and shows error. Please modify files for me, really this is big problem for me. Name or path of the BCD "read here"
Edited by memoarfaa, 18 November 2015 - 03:46 PM. Could you help me modify the bcd path of this .efi to \efi\Microsoft\Boot\BCE (currently it is \efi\Microsoft\Boot\BCD). search for hex "5C 00 42 00 43 00 44 00 00 00"
replace it with hex "5C 00 42 00 43 00 45 00 00 00"